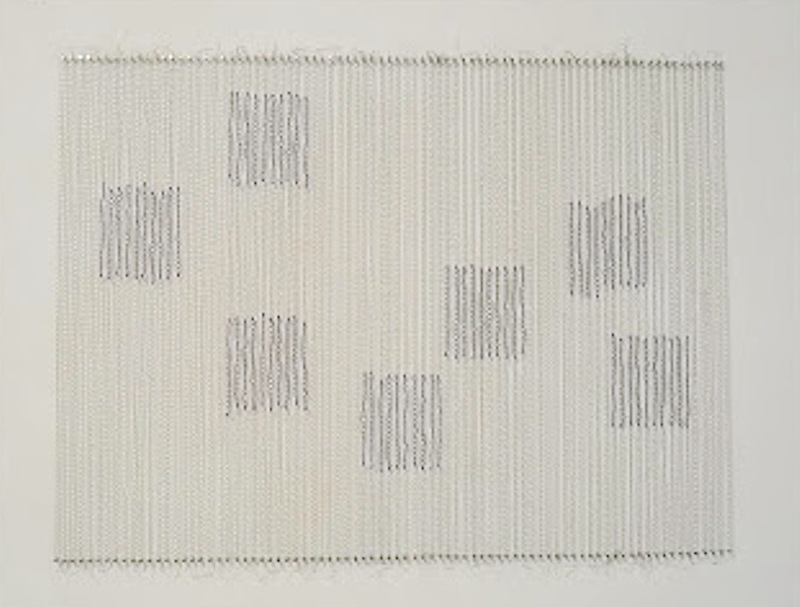 Ahn Wells works on paper using a vocabulary of minimalism and abstraction combined with the use of textiles and fibre, stitching together references to the ‘high art’ of mid-20th century Modernism with memories of the domestic labour and craft of women. She told me that she generally works in a square format evoking the Modernist grid, but decided to make scroll-shaped works for this exhibition. ‘Inscription’ I and II are subtle and quiet. On close inspection they reveal richly layered pale gouache, oil pastel, ink, stitching, and finally a scribbled layer of pencil marks on paper punctured with tiny holes, prompting all sorts of memories and associations, from Pianola rolls to computer coding to the scribbles of children. Encryption, encoding and written script in all its forms are evoked in a manner that subtly suggests the sheer difficulty of communication and the ease of misinterpretation.